glass and bottle cutter	tool. Introducing the enjoyable hobby of bottle cutting. 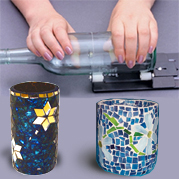 The unique items which can be made by cutting glass bottles is limited only by your imagination. Beautiful products can be made from discarded glass bottles making this hobby very inexpensive and even profitable if you decide to sell your finished creations. We have sourced this glass and bottle cutter tool from the USA and we believe it is one of the best starter kits to introduce you to this fantastic hobby. Sturdier and easier to use than plastic models, this highly durable metal bottle cutter will have you cutting bottles perfectly in 5 easy steps. Simply place your bottle on the support device, apply pressure, and rotate. Heat the score over a candle flame and cool with ice. The results will amaze you, clean breaks nearly every time. Even thick champagne bottles break easily and smoothly. 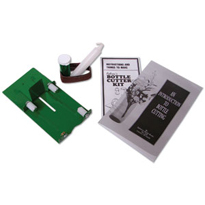 Kit Contains everything you need completely assembled and ready to use: Bottle cutter Candle Polishing paper Easy instructions Idea book on what you can make Includes a bonus booklet "An introduction to Bottle Cutting" by Ephrem's Bottle Works. * 22 projects to choose from in the instruction booklet. Here is an excellent video from Ephrem on how to use the kit. Bottle Art By Cindy Shepard- A fantastic book with a variety of projects from wind chimes, chalkboard bottles, unique glassware for your home. This book teaches you how to reuse and recycle glass bottles to create fantastic works of art. 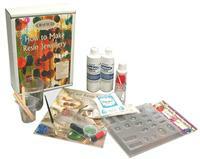 How to Make Resin Jewellery Kit - A complete kit which provides all you need to make your own resin jewellery. Learn to fuse glass in your microwave - Create stunning pendants, fashionable earrings, snazzy bracelets and more with this easy to use kit. 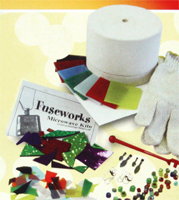 A great kit for young adults and grown-ups who want to learn a craft they'll enjoy for a lifetime! own resin jewellery.